Carraway’s exclusive product is Kyocera. Founded in 1959 in Kyoto, Japan, Kyocera produces all sorts of printers, tools, components, displays and more to help a business be successful. The brand started in North America in 1969 with only two people serving as their sales team. Now they have over 3,000 employees nationwide. Kyocera manufactures a broad range state-of-the-art products that are built with longevity in mind. The brand produces over 15 different categories of products ranging from dental and medical practice tools, to ceramic cutlery. They even engage in different social platforms for different aspects of their business. Here at Carraway Office Solutions, we work with their products because we know they produce the best quality in the business. We keep over 100 of their products in stock to ensure that our clients are getting the best on the market. Their products include a line of highly efficient printers with speeds of 42 pages per minute. 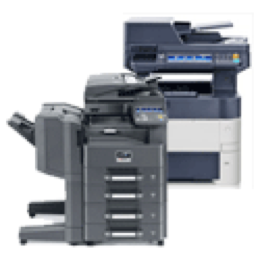 Kyocera products also include standard copy, fax and color scanners. A benefit of Kyocera is finding the machine that is the right fit for your office, the brand carries a variety of sizes so you can find your right fit. Their sizes also include tabletop products for offices with even smaller spaces. Our Carraway Office Solutions team is also here to help you with service orders for any of your Kyocera office printer issues or concerns. Please feel free to use our contact us page to get an appointment from one of our team members on which product is the right fit for your office!